Books and a good cup of tea are two of life’s great pleasures. What better way to enjoy your morning cuppa than curled up on a couch, wearing this beautiful cardigan, reading your favorite novel? This cardigan features a garter and mirrored cable on the v-neck fronts and center back. Waist shaping is worked at the front and back dart lines, and three-quarter set-in sleeves are flared over the forearm. 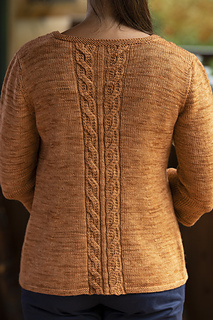 This versatile cardigan can be worn with or without buttons; pattern includes instructions for both options. Miss Babs Killington (85% Polwarth Wool, 15% Tussah Silk; 700 yd/8.5 oz (640 m/240 g) skeins) 2 (2, 2, 3, 3, 3, 3) skeins, shown in Caramel. Or approximately 1150 (1250, 1375, 1470, 1575, 1675, 1790, 1925) yards/1051 (1143, 1257, 1344, 1440, 1531, 1636, 1760) meters of a sport weight yarn. Shown in 34 1/4”/87.5 cm with -1 to +2”/-2.5 to 5cm ease.